1. MOST CLICKED LINK: The Peafowl Feathers Shawl by Blue Star Crochet Company – This lovely FREE crochet shawl pattern features an unusual construction! 2. 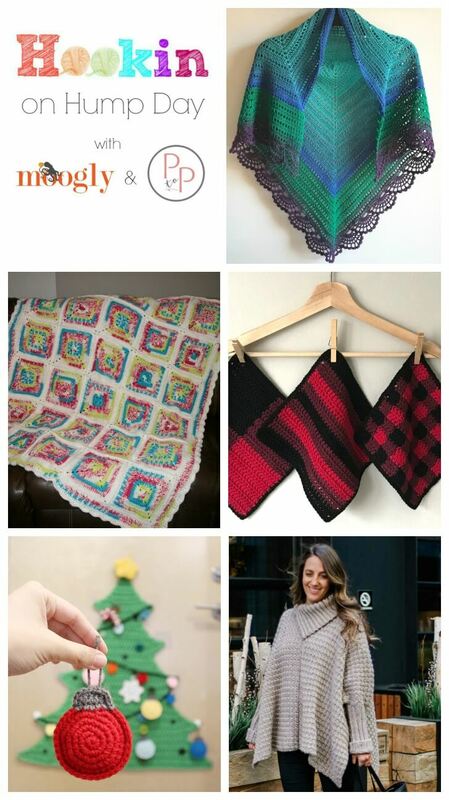 Buffalo Plaid Crochet Dishcloth Set by Stitching Together – Jump on the tartan trend with this fab FREE set of plaid crochet patterns! 3. Aliviah’s Christmas Afghan by Coletta’s Kitchen Sink – This personal project may be simple, but it was made with love for a wonderful cause – and it looks fab! 4. Flatland Christmas Bauble Ornaments by Once Upon a Cheerio – These stuffed ornaments are just too cute – get a jump on next year with this FREE crochet pattern! 5. Crochet Poncho with Sleeves by Make & Do Crew – Simple crochet geometry turns basic rectangles into a stunning, cold weather poncho in this FREE crochet pattern!